We are a refugee settlement group that began on a hot summer night, July 9, 1997, in the living room of John and Heather Kleiner. John had been asked by a friend who was part of a Winnipeg group called NEST (North End Sponsorship Team), to help sponsor one of a number of Nigerian refugees. The refugees had taken asylum in some German Lutheran churches and were being forced to move back to Nigeria. John gathered a group of friends and colleagues to get their support. When this particular sponsorship did not materialize, it was the beginning of a venture that is now in its 20th year. After we realized that we were not going to be able to bring one of these men to Canada, we decided we still wanted to work together to bring and help settle refugees. We adopted the name Nest from our Winnipeg peers but understood it as meaning a safe sanctuary for refugees. We quickly learned what one needed to do—our biggest help being from Canadian Lutheran World Relief, who is what is known as a Sponsorship Agreement Holder, or SAH. An SAH is a group authorized by the federal government to act as so called “middle men and women”, liaising between the government, groups like Nest, and prospective refugee claimants. We decided to proceed with what the Government of Canada referred to as an “unnamed sponsorship” application; someone whom we didn’t know but who had already been approved to come to Canada. Our first refugee was Margaret, a woman from South Sudan whose village had been overrun by rebel soldiers. Margaret’s brother was killed and her sister-in-law disappeared as everyone was fleeing and the village set on fire. Margaret remained in the bush until the next morning when the soldiers had all left. She went back to the village and found her two nephews who had hidden in the place the family had told them to go if there were trouble. She took the two boys and headed east. It was a long walk before they finally ended up in the UNHCR refugee camp outside of Nairobi, Kenya. It was from there that she was interviewed by the Canadians as a potential candidate to come to Canada. After Margaret arrived, it took us a long time to bring the boys, but we were finally able to do so. Later we brought Margaret’s mother, two of her sisters and their children. Margaret, whom we now call ‘Margaret the First’ still lives in Saskatoon and is an active member of Nest. Not long after our first few refugees had arrived, we decided to give priority to settling single women with children at risk. As time went on, we brought some of these women’s extended families. Many of these people needed extensive help and we were/are blessed to have access to the Open Door Society which was set up by the government to provide assistance and information to refugees and refugee sponsors. Ebtsam Elsheikh (very left) has been in Saskatoon for some time and serves on the Nest Executive. Ebtsam is pictured here with some of the newest people sponsored by NEST, her reunited family (left to right): Ebtsam’s niece Alaa, sister Saphia, niece Safaa, and nephew Abdullhai. Starting a few years ago, the government shifted more of the financial burden on to the sponsorship groups, such as Nest. In the early years, all of the funds for settling refugees were provided by the federal government and our group did all of the settlement work. Now if we sponsor an unnamed refugee, the government will provide six months of funding at social assistance rates which are very inadequate. We are responsible to come up with the rest, which consists of both supplementing the six months provided by the government, and coming up with money to cover an additional six months of support on our own. If we want to sponsor a named refugee/s (one or more people whom we identify), we are required to come up with all of the funding. Consequently, we need to spend more of our volunteer hours doing fundraising. The work of applying for and settling refugees has become increasingly more difficult due to this situation, as well as a limited number of volunteers. Some of our fundraising activities have included a ‘Secret Garden Tour’ each summer, a garage sale, a House Tour, an Ethnic dinner prepared by some of the refugees we have sponsored, steak nights, sale of lily bulbs, etc. We receive donations from congregations and individuals and have received some grant money. Early on we spent a lot of time writing a constitution and by-laws in order to apply for charitable status and it was granted. 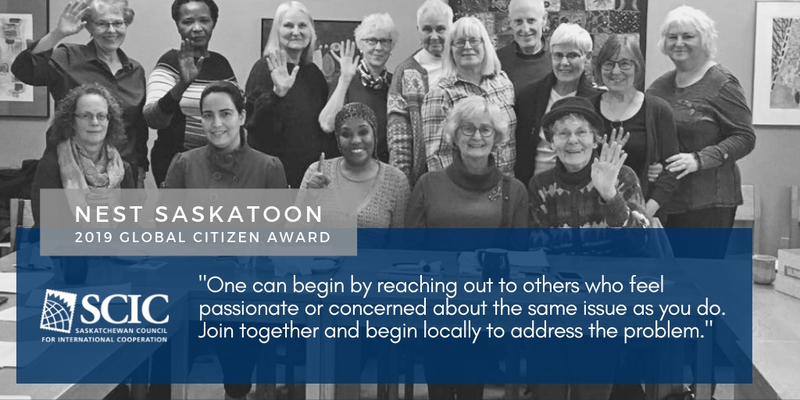 Want to support Nest Saskatoon? Have a fundraiser idea? Want to volunteer? 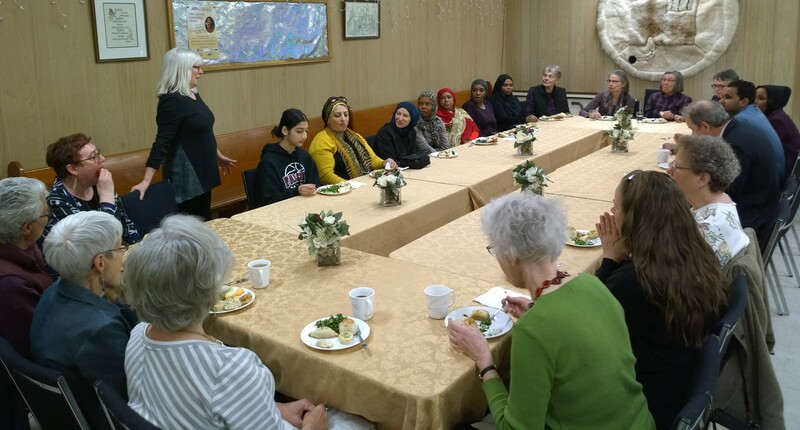 More than 20 people gathered at Augustana on April 22, 2018 to welcome new refugees sponsored by Nest. The late John Kleiner was the founder of NEST more than 20 years ago, and many Augustana members have helped with the work of Nest over the years. Over the past twenty years Nest has had the privilege of sponsoring approximately one hundred refugees from ten countries. This includes Myanmar, Sudan, Eritrea, Pakistan, Burundi, Iraq, Columbia, Liberia, Afghanistan, and Syria. We are awaiting the arrival of seven families, two of whom could arrive in the near future. Two of our more recent arrivals included a man from Myanmar who got off the plane with all his belongings in one shopping bag and an Eritrean family of seven who arrived with two small bags to their name. Both these groups had no winter clothing and some had no socks and only the clothing on their backs. Previously, the Government had provided winter coats and boots at their point of entry, yet this appears to no longer be the case. Fortunately, our group had come prepared with donated winter clothing. We are thankful to be able to offer a new life for these people and are able to do so because Canada allows individuals who are part of a group such as Nest, a faith community, or groups of five, to sponsor refugees through a Sponsorship Agreement Holder. As mentioned earlier we have worked through Canadian Lutheran World Relief and in recent years we have also worked with the Anglican Diocese of Saskatoon who is also a Sponsorship Agreement Holder. However, life here can be a challenge for many of the refugees we have sponsored even those who are well educated. For some mastering the English language can be extremely difficult. Many of the single parent women end up working in strenuous and low paying jobs like cleaning office buildings for years in order to scrape by. Some are not able to adjust. Two of our older women returned to their home land and there are a number of young Sudanese men who committed suicide buried in a cemetery in Saskatoon. Yet, for the majority of the refugees Nest has sponsored, life in Canada has brought possibilities and opportunities, and opened up a whole new chapter when the horizons had once seemed relentlessly bleak. For this we are especially grateful and humbled to be part of their journey.